It’s the old school leather bag that has ‘taken the fashionworld by storm’. I’ve seen it all over, and no matter what size, what colour, I’ve lusted over it. I first saw these bags in person in the Oxford Street Urban Outfitters over the summer. They had a selection of the fluorescent series . These are so lux. 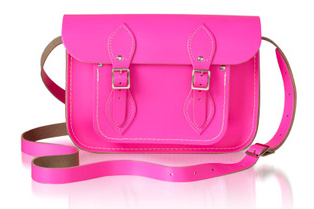 I was incredibly in love with the fluorescent pink, but just couldn’t justify the spend. Now I've seen them in a few more blogs and websites, and I think I actually must have one of the classic colours. I'm leaning towards navy, because I love navy and it goes with most of my clothes... but also crave a bright red or green for something funky. 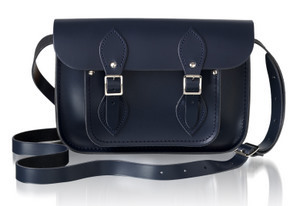 You can still get the bags direct from the Cambridge Satchel Company, but you can also buy them at Asos, Urban Outfitters, and even Paperchase! Which colour is your fav? Are you tempted? Update: I finally bought myself a Cambridge Satchel! Check it out here!